Home ♦ Art ♦ Why is Adult Colouring So Popular? Mental health awareness has increased in recent years, which is a fantastic change brought about by relentless campaigning and the breaking down of barriers, by charities and individuals alike. Unfortunately, the number of people who are living with a mental health problem in the UK hasn’t changed much at all. In fact, it is claimed by mental health charity, Mind, that a shocking “1 in 4 people in the UK will experience a mental health problem each year”. A survey by the Health & Social Care Information Centre in 2009 (the last figures available from the Centre) of people living at home (i.e., not in hospital or prison) revealed that the most common form of mental illness was anxiety. 4.7 in 100 people lived with anxiety that year, and 9.7 in 100 people had a combination of anxiety and depression. That totals 14.4 people in the UK trying to live with a noisy brain. This total doesn’t even include other types of mental illness, such as depression without anxiety. With so many people in the UK living with anxiety, how are we coping? Depending on many factors including severity, some people can’t cope, but some can – so how do those people carry on with their day to day lives? How does anyone manage to do that with such a busy and negative mind? Mind suggest ‘shifting your focus’ as one of several self-help solutions, and creative hobbies are great for this in the combat of stress, anxiety and depression in some people. Using fine motor skills is excellent too, as it requires such accuracy and concentration. Knitting is quite in vogue at the moment, and I wonder if that popularity could be pinpointed to its relaxing, calming effects, and perhaps also the sense of achievement one feels when a scarf or hat is completed. The current popularity of colouring books for adults could very well be representative of our country’s mental health battles, and also an indicator of us wanting to help ourselves in achieving a healthy and balanced mind. As I write this, the Amazon Bestseller Top 10 book list includes 4 adult colouring-in books. Four! The newly released (and hotly anticipated) Grey: Fifty Shades of Grey book is sat at number 7 in the chart, with 2 colouring books ahead of it. Who’d have anticipated that situation! 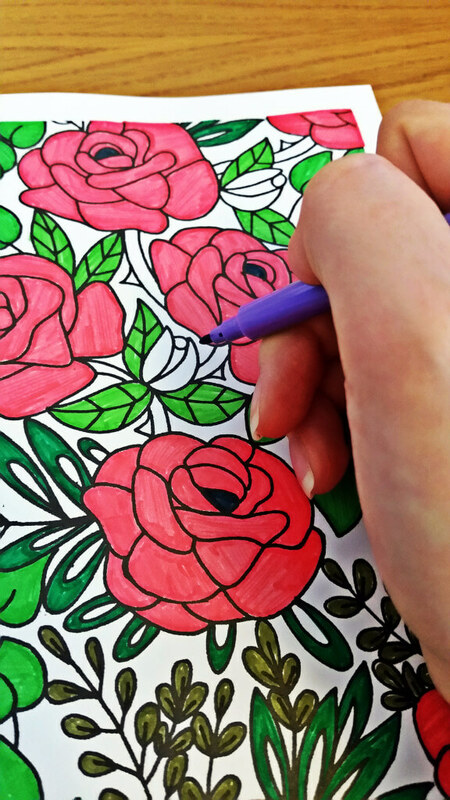 Lucy Fyles is a housebound reviewer of adult colouring books, through her own dedicated blog. Lucy has a severe anxiety disorder, and has also worked in a psychiatric inpatient centre as a nursing assistant. Both Lucy, and her patients when she was working, have found huge relief and calm in the pages of adult colouring books. It is low-stress, there’s no pressure, and if we go wrong, nobody has to know about it – we can just start again on the next page. No wonder it has caught on with adults; not only does it feel nostalgic for most of us, but it is also rather therapeutic and something to do alone. Colouring-in as an adult also feels rewarding. Apps such as Draw Something became quite popular a couple of years ago, but not for long. I wonder if users enjoyed the drawing aspect, but either wanted more freedom, or just wanted to create on paper instead. After all, the wonderful thing about colouring is you can do it anywhere and it isn’t digital! In our modern, digital world, it is often enjoyable to escape the noise of life for a while and get back to basics. 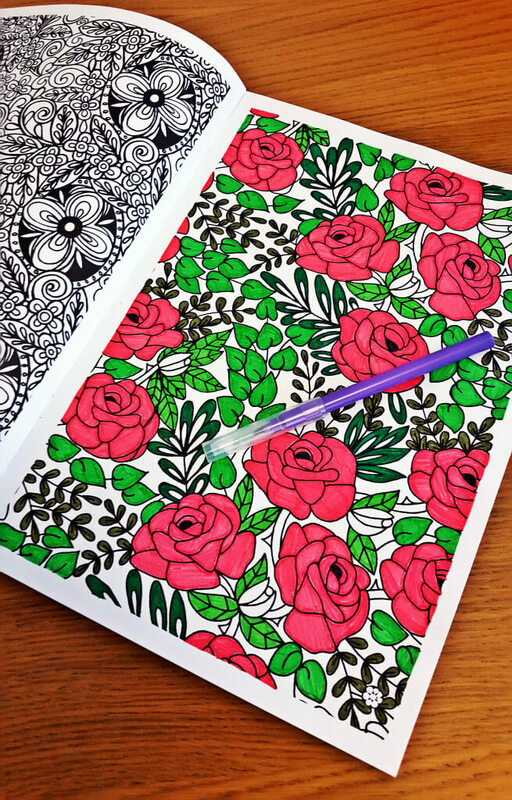 With so many colouring books on the market, why not give one a go? There are book themes are varied as cats, secret gardens, butterflies, Paris, patterns, medieval, birds and mathematical; there really is something for everyone. 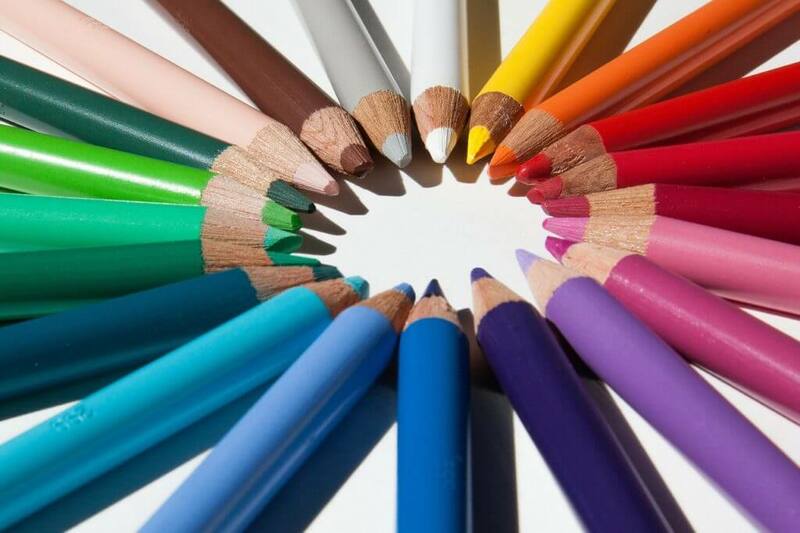 Although, once you’ve made the difficult decision of which book to buy, you then have to decide between coloured pencils or felt tips! Wishing you all good mental health, and happy colouring.